Continuing along the Venice and Italy theme of recent posts, here is my latest photographic work which shows a heavily textured scene, typical of Venice in every respect. This photographic work is called ‘Venice in Blue‘ and was taken on my recent travels to the heart of the Italian city in April. Featuring the classic gondolas in their moorings and the wonderful Venetian architecture in the background, this photograph sums up the majesty and atmosphere of Venice. I have the original RAW file still but these days I get more enjoyment from creating images that have an artistic processing, especially with scenes like this one. Venice is an artistic city so it is a fine way to compliment it with some nice textures, colours and filter work in Photoshop. It helps capture the essence and atmosphere that you feel when wandering around Venice. I hope you are enjoying the photography. I like Italy. No, actually I love Italy. The romance, architecture and way of life is just beautiful. Venice is one of the most stunning cities in the world, thanks to the beautiful buildings and of course it’s water ways. I took this photograph in April this year and have only just got round to processing the RAW. That’s the trouble when you go away and come back with several hundred RAW images that need processing individually by hand, or mouse to be more exact! 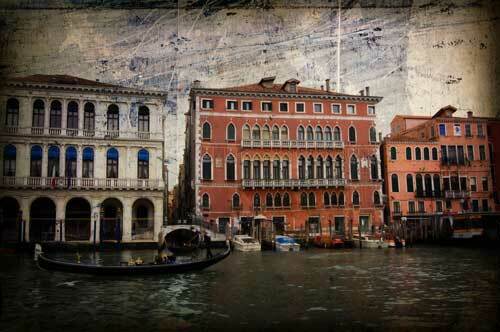 As Venice has so much rich history I thought this image deserved an antique look to it so I found some creative textures which I then applied in Photoshop. A combination of 2 texture files, several filters and layer adjustments brought the desired effect, and it was shown on the DCMag website homepage for a short while so I must have done something right! I think this represents the old Italy quite well. Venice is definitely a photographers paradise and I can’t wait to go back again. Then again, I still have some RAWs to process from last year in Florence where I got married so I need to pace myself better!